With the conductivity meter PCE-CM 41 it is possible to measure conductivity value, the amount of all solid material or dissolved salts (TDS - Total Dissolved Solids) and temperature. 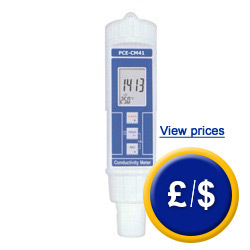 Due to its small dimensions conductivity meter PCE-CM 41 is very easy to carry everywhere. The water resistant enclosure protects the device (it is also protected against dust). The measurement of EC and TDS conductivity has an automatic temperature compensation. The conductivity meter PCE-CM 41 can be used in the industry, fish farming, horticulture and others. 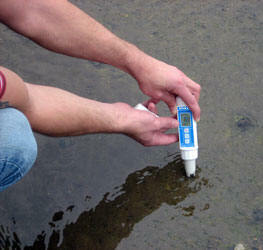 At the following link you will find the conductivity meter that best suits your needs. - Auto shut-off: to protect battery life.